An activity logs interactions like phone calls, emails and in-person meetings to create an accurate, detailed history of your business relationship. Activities are tracked within the Activities App. 1. Click ⊕ New on your Activities App, or click ⊕ New Activity from your Activity List. 2. When the New Activity screen opens, choose a contact if not already selected. This will populate the phone and email fields related to the contact. 3. Include Comments on your activity to provide context. This will also show up in later for follow-ups. 4. Assign Tags to this activity if applicable. Assigned To*: Assign a Method user to this activity. By default, this will be the user currently signed in. Type*: There are a number of interaction types for you to choose from. You can also create your own interaction types by clicking New / Edit Activity Type. Status*: The status indicates the progress of the activity. You can create your own statuses by clicking New / Edit Activity Status. Start Date & Time* and End Date & Time: When the activity starts and ends. The End Date & Time field only appears if appropriate, e.g., a meeting. Frequency: Selecting the pencil icon allows you to set this activity up as a recurring activity. For more information, please see our article on Recurring Activities. Notify Assigned To: The user assigned will receive a notification email when you save the activity. Attachments: Attach a file to this activity. Related Case: Relating this activity to a case will have this activity show up in the case's App Ribbons. Related Opportunity: Relating this activity to an opportunity will have this activity show up in the opportunity's App Ribbons. Attachments: Files can be attached to this activity. The file will, however, only be accessible from this activity. 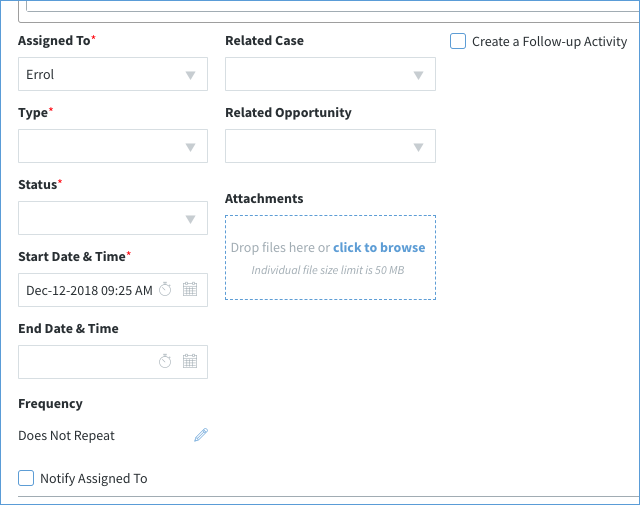 Create a Follow-up Activity: If you would like to schedule a follow-up activity, this checkbox will expand a section to fill in the information for the follow-up. See Schedule a follow-up for more information. At the bottom of the activity are buttons to save, email, and delete. Email Contact: You can choose to create and send an email when you save this activity. Checking this option will take you to the Send Email screen after you Save. When you send an email in this way, the details of that email will be associated and viewable with this activity. Save & New: Save the activity and clear the screen to input a new activity. Complete & Back: Complete the activity and return to the previous screen. Save & Back: Save the activity and return back to the previous screen. When you save your activity, it will be viewable in the Activity List. Notification emails will be sent at this time. To create an activity as part of an ongoing opportunity, please follow these steps. 1. Click the Opportunities App on the dashboard. This opens your Opportunities List screen. 2. Locate the opportunity you wish to link this activity to, and click on it. You can search manually or use the search function at the top of the screen. This opens the Edit Opportunity screen. 3. Click ⊕ New on the Activities Open app ribbon. 4. Then follow the steps above, to add a new activity. Your activity is now linked to the opportunity, which means it appears in the Activities app ribbon for this opportunity.